Shreyosree Roy as Bhanumoti , Rubel Das as Meghraj , Arindom Ganguly as Narendra Sarkar , Debaparna Chakraborty as Maya. Bhanumotir Khel is an Indian Drama Serial that was first premiered on Zee Bangla TV channel on 07 January 2018. Its Latest Episode was broadcast on on Zee Bangla TV channel and was of 20.8 minutes duration excluding ads. 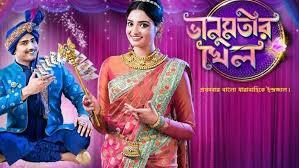 Drama Serial is production of zee bangla and is directed by Abira Majumder & Sayan Dasgupta . You can watch All Episodes of including Today Episode of Bhanumotir Khel Zee Bangla TV channel here in best quality. Please upload Amloki plz.Thank you.